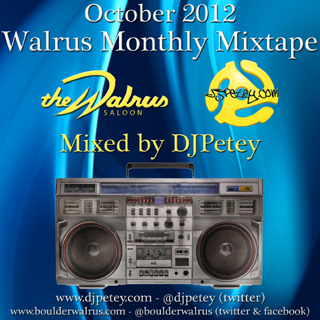 FREE DOWNLOAD – October 2012 DJPetey Mixtape | DJPetey.com!!! In the music world, the big boys release albums in the 4th quarter. Which means, the amount of new music that comes out every day between now and Christmas is crazy! Chopping this mix down to 80 minutes was the hardest part about making it. Basically, Im excited about this one! As always, there are a few ways to get this month’s FREE Mixtape. If you are a podcast subscriber, you have it now! If youre not, you should be. You can get more info on that HERE. You can download or stream the full mix right now by clicking HERE (right click, save as to download – left click to listen now). Or, if you want a physical CD for the car, you can stop by the Walrus any Wednesday or Saturday night and come ask for a free copy (while supplies last obviously). If you wanna check out the track list, click “read more” below. But no matter what you do, most important, tell a friend to tell a friend! Welcome to October! 27 – Ray Bands – B.O.B.